A sad story at the cottage . I have been watching our resident sparrows make their nest in an old bird house on a pine tree in our yard. They are delightful to watch. They were on their second flock in a nest when disaster struck. A red squirrel was intend on disturbing the nest. The birds attacked and shooed the squirrel away. He must have come back in the night. The next day we saw him with an object in his mouth. It was a dead baby sparrow. The night again the nest was attacked threw roof was torn off and the nest was on top of the mangled roof. We have seen the parent sparrows but they won't go near the nest. Nature is fascinating but cruel. 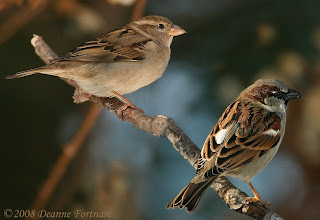 I found this beautiful photo on Google by Deanne Fortune of two sparrows similar to mine. I drew this sketch of the birdhouse and nest the weekend before the disaster. More sketchbook pages with a bird theme. The birds are traced on deli paper and collaged onto the page. Lovely sketchbook pages. How sad about the sparrow nest. They invest so much time and energy in trying to raise their young too. Is the cottage your holiday home? Cruel indeed. What an awful story...so sad. However, your journal pages are beautiful as always! Great work Donna!